A No Connection error on the admin login page occurs when your server has been unable to connect to our licensing server for several days. Read this guide to understand what it means and how to troubleshoot. CURL - CURL is an extremely important part of WHMCS and is needed for a number of the operations performed such as server connections etc. DNS - DNS is a vital part of internet functionality in order to be able to resolve hostnames of servers, domain name lookups, and licensing. 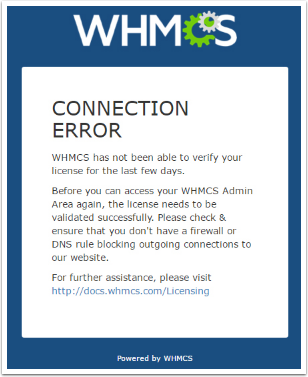 Ensure your DNS resolve whmcs.com to the correct IP address. If you see any errors, it will be necessary to work with your server admin/hosting provider to resolve the cURL connectivity issue. Showing the test results should assist in their troubleshooting. Some hosting providers may operate very restrictive environments, which results in a No Connection error despite the aforementioned test returning a successful result.